Kidspiration Maps is a kid friendly mind-mapping app for the iPad. Kidspiration is similar to the Inspiration Maps, but Kidspiration includes more kid friendly templates and clipart like graphics. Kidspiration allows users to create mind mapping webs to help organize ideas and information visually. Unlike Inspiration Maps, Kidspiration allows users to insert a large variety of clipart images into their maps. Kidspiration also includes the ability to add a recorded voice note; a feature that is unfortunately missing in Inspiration Maps. Kidspiration Maps includes a large number of pre-loaded templates for reading and writing, social studies, science, and math. These templates are geared for elementary school children and range from an �all about me� web to sorting and matching activities. If no template is applicable there is an option to start a new document. One template contains a number of words and instructions to arrange the words into alphabetical order while another asks kids to match states to their capitals. With the nice visuals these activities can be engaging and easier than using physical manipulative. Teachers can also create actives with text or voice instructions. One negative is when the student is completing the actives there is no way to program the correct responses in order to give the student immediate feedback. Also, when searching for clipart students cannot search for an image by keyword, but instead must scroll through long lists of images. In addition to web view, there is also list view in which users can view and edit content as well. After completing a document it can be saved to the app, emailed, saved to photos, sent to an app, or saved to Dropbox. Kidspiration Maps is a well-made app that is worth looking into. Kidspiration Maps can be downloaded from the App Store for $9.99. If you would like to try Kidspiration before you buy click here to download the lite version. Correction: The original post stated that the shape text boxes could not be changed after they were created. The shape of a text box can be changed by selecting the original text box and double tapping the new shape in the menu. To view screenshots of Kidspiration Maps in action click here. App was provided complimentary to reviewer. We�ve known for some time that a BBM app for Android and iOS will be coming, but nothing had been set in stone as far as launch dates go. Last week, user guides for both varieties of mobile operating systems leaked, hinting that BlackBerry messenger would likely be arriving soon, and that conclusion seems to have been spot-on, with a landing page going live over on BB�s website briefly. To familiarize users of Android and iPhones with the BlackBerry-centric messaging service, BlackBerry has created a basic sign-up-for-notifications page that allows the curious to sign up for notification about the app�s launch. In addition to that is a link to a BBM support page that contains, among other things, a full user guide for the service. Not too long ago, however, someone apparently pulled the trigger too soon and a semi-functional launch page was posted, complete with links to download the Android and iOS versions of the app (that didn�t link to anything yet). That URL now redirects to the notification sign up page, but the folks over at Crackberry managed to grab a screenshot of the launch page before BlackBerry pulled it. And with that � considering the semi-functional page, leaked user guides, and whatnot � it seems we can expect an official launch any day now. There�s still no word on when the apps will be available, however, so those who have been waiting patiently will need to keep doing so. What do you think? Let us know in the comments! Learning Ally is another provider of accessible books for the blind and dyslexic. Learning Ally mostly provides human narrated audio books for their members. Learning Ally is also expanding to provide �VOICEtext� books which include human narration and highlighted text. The highlighting of �VOICEtext� books is not word by word like in Bookshare and Kurzweil but rather is paragraph by paragraph. Learning Ally books can be read on iOS and Android devices using the Learning Ally Audio app. Click here to learn more about Learning Ally. Co:Writer by Don Johnston is an app for iPhone, iPad, and iPod Touch. Co:Writer has exceptional word predication capabilities that can help struggling spellers. Co:Writer�s most unique and noteworthy feature is the ability to use topic dictionaries to improve word prediction based on the topic a student is writing about. For example, if a student is writing about World War II he or she can turn on the World War II topic dictionary in order to get more targeted word prediction. Click here to learn more about Co:Writer. Click here to download Co:Writer from the App Store. Learning Ally Audio App is now available in beta for Android devices. Learning Ally is a provider of audio books for the blind and dyslexic. The newly released Android app provides access to Learning Ally�s collection of 75,000 audio books for members with Android devices. From information provided on the apps Google Play page the Android version seems to have features comparable to its iOS counterpart. The app is available for free on the Google Play store and require a Nexus 7, Samsung Galaxy Tab, or Motorola Droid Razr with Android 4.1 or later. Click here to download the Android version from Google Play. To learn more about the iOS version of Learning Ally Audio click here. To view screenshots of Learning Ally Audio for Android in action click read more below. 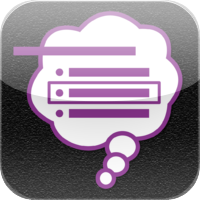 Don Johnston�s powerful word prediction software, Co:Writer, has made its way to iOS. The newly released Co:Writer app works with the iPhone, iPad, and iPod Touch. It is important to note that the Co:Writer app has multiple different variations depending on your dialect. For example, there is a separate app for British and United States English. To start using the powerful word prediction built into the app you can simply start typing. A bar appears on top of the keyboard with five suggested words based on what you are typing. On the iPhone and iPod Touch some longer words are cut off in the predication bar because of the smaller screen. Tapping on a word inserts it into the document. As each word is added it is spoken aloud with text-to-speech. The word prediction is helpful for struggling writers and spellers. The word prediction can help a writer who doesn't know the spelling of a word by spelling the word if you can type the first few letters. Once you have completed your sentence it is spoken back to you. Co:Writer also includes a speak button with reads the entire document with text-to-speech while highlighting the spoken word. Co:Writer also has one more amazing feature. You can tell the app what you are going to be writing about to receive even better word prediction results. The app includes many topics such as William Shakespeare, Albert Einstein, and Global Warming. If you enable the Einstein topic dictionary it will give you word suggestions based on words related to Einstein. With the Einstein dictionary on, typing it the letter �r� leads to the suggestion of �relativity.� These customizable predictions help to make writing a smother process. When you are ready to share your writing you have numerous options. You can share it via messages, email, Dropbox, Google Drive, Twitter, or Facebook. In addition you can copy your work to another app. Co:Writer sells for $17.99 in the App Store. Click read more below to view screenshots of Co:Writer in action. Inspiration Maps is an iPad app that allows you to visually organize information. Inspiration Maps makes it easy to create clear mind maps that can help organize information for an essay or walk a student through a multi-step science experiment. The app comes with number of great looking templates for all different subject areas. If none of the templates meet your needs you can create your own. To start you can tap on any box or bubble and add text. You can also change the color and shape of the text boxes. To move an object you can simply drag it around the screen. Pretty much all aspects of your mind map are customization from arrow, to text box shape, to text style. Another handy feature is the ability to add images to your documents. These pictures can really add some life to your documents. In addition to diagram mode there is outline mode which is a text document. The document can include different bullets and numbered lists to help with the writing process. Everything added to the outline mode will be added to appear in the diagram mode and vice versa. Once you have finish you can export the diagram as a PDF or PNG for use in other apps. You can also send it via email or Dropboxs a Inspiration Maps document. Unfortunately, Inspiration Maps does not include built in text-to-speech but Speech Selection can be used if enabled via the iPad's settings. To learn how to turn on Speech Selection click here. Click here to download Inspiration Maps for $9.99 from the App Store. The app was provided complimentary to reviewer. Click read more below to see more images of Inspiration Maps in action.